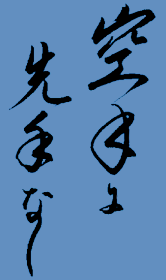 The Japanese writing to the right stands for 'Karate Ni Sentenashi', a basic and very essential part of karate training. It means that the Karateka must never attack first - mentally or physically. To understand this fully, years of hard, correct training are needed. As the Karateka grows in stature so also will grow their good manners and etiquette, both outwardly and, more importantly, inwardly. Included in the concept of 'Karate Ni Sentenashi' are intense, purposeful Karate training and correct dojo etiquette.